Still, only some Faustian bargain can explain the stardom of Miley Cyrus, aka Hannah Montana, but it is our souls that are left picking up the tab when subjected to such mind-numbing idiocy as this sophomore offering in the lucrative Disney series’ film canon. 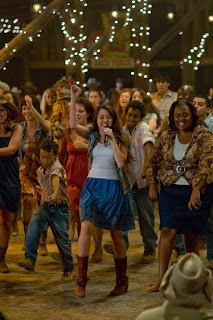 Caught up in the insular popularity of her Malibu alter-ego, Miley Stewart (Cyrus) is shanghaied by her dad (Billy Ray Cyrus) back to her Crowley Corners, Tennessee roots for some “Hannah detox.” Of course, the film ends with Hannah throwing a benefit concert for the entire population of her hometown, so I guess the treatment didn’t take. Anyway, Miley sports designer overalls, drops her consonants, and pratfalls her way through such authentic, homespun therapy as feedin’ chickens, ridin’ horses, gatherin’ eggs, and some foot-stompin’, ear-piercin’ hoedowns with Rascal Flats and…oh dear Lord, please, not Taylor Swift. There is also a blond, cowboy hat clad love interest (Lucas Till), a pesky Brit tabloid reporter trying to dig dirt on Miley/Hannah (Peter Gunn), and a real estate developer who wants to erect a shopping mall against the town’s Smokey Mountain skyline (Barry Bostwick). In other words, it’s one cardboard cutout character and inane cliché after another, leaving all of us in dire need of some intensive Hannah detox.